A study provides substantial insight into the E3SM performance in clouds and precipitation and guidance for future E3SM development. The DOE Energy Exascale and Earth System Model (E3SM) Atmosphere Model (EAM) has undergone significant changes in physics, model resolution, and parameter settings during its development from its version 0 (EAMv0) to version 1 (EAMv1). In particular, it implemented a simplified third-order turbulence closure parameterization (CLUBB; Cloud Layers Unified By Binormals) to unify the treatment of planetary boundary layer turbulence, shallow convection, and cloud macrophysics and remove the unrealistic separation among these physical processes. The model resolution was increased from 10 to 0.250 in horizontal and from 30 layers to 72 layers in vertical to better describe meso-scale convective systems (MCSs) and resolve vertical structure of atmosphere. The EAMv1 was also significantly re-tuned to obtain a reasonable top-of-atmosphere (TOA) energy flux for coupled simulation applications and to optimize model performance. These changes have resulted in notable changes in model simulated climate in comparison with EAMv0. To understand what cause the model behavior changes and provide guidance to future E3SM developments, a research team led by scientists at the DOE Lawrence Livermore National Laboratory, Brookhaven National Laboratory, Pacific Northwest National Laboratory, and Oak Ridge National Laboratory along with their institutional collaborators conducted a number of sensitivity experiments to isolate the impact of changes in model physics, resolution, and parameter choices on the simulated clouds and precipitation with the goal of providing insights into the EAMv1 simulated clouds and precipitation characteristics and the underlying physical processes. Accurately projecting future climate changes requires continued effort to improve the representation of atmospheric physics, particularly aerosol, clouds, convection, and their interactions and to increase model resolution to resolve detailed atmospheric structures. The in-depth analysis performed by this study on the impact of each individual changes in model physics, resolution, and parameter choices on clouds and precipitation provides substantial insight into the model behavior changes and guidance for future E3SM development. EAMv1 showed an overall considerable improvement in the mean state of clouds, cloud radiative forcing, and precipitation in comparison with EAMv0. These include 1) increased stratocumulus (Sc) (except near the coasts) and trade-wind cumulus (Cu) as well as a better transition from Sc to Cu, which in turn leads to enhanced shortwave cloud radiative forcing over these regions; 2) notably reduced biases in longwave cloud radiative forcing, especially over tropical land and adjacent oceans; 3) notably improved precipitation over the oceans adjacent to the Indian peninsula and tropical eastern Indian ocean. EAMv1 continues to have dry biases over the Amazon region as EAMv0 does, but the magnitude in EAMv1 is much smaller. 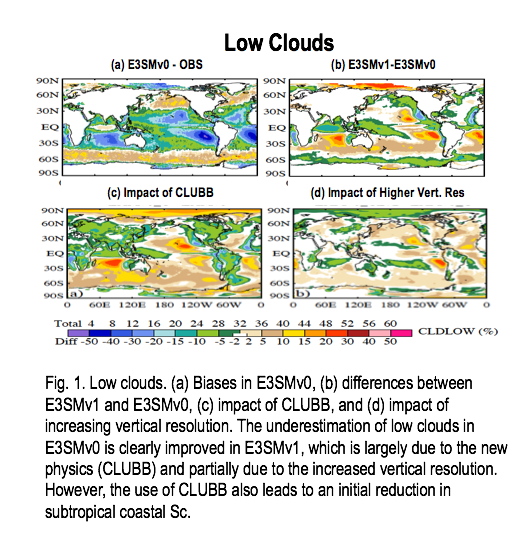 Other outstanding issues with EAMv1 include the substantial reduction of Sc off the west coasts of major continents in the subtropics, the largely reduced high clouds over Tropical Warm Pool (TWP), the general lack of low and middle level clouds over deep convection regions, as well as the dry bias in TWP and South East Asia. The overall improvement in EAMv1 clouds and precipitation is primarily attributed to the introduction of CLUBB. This lack of Sc is considerably improved by increasing vertical resolution from 30 to 72 layers, but the gain is unfortunately subsequently offset by other retuning to reach the top-of-atmosphere (TOA) energy balance. Increasing vertical resolution also results in a considerable underestimation of high clouds over the TWP, primarily due to the selection for numerical stability of a higher air parcel launch level in the deep convection scheme. Increasing horizontal resolution from 10 to 0.250 without retuning leads to a degradation in cloud and precipitation fields, suggesting the need to improve the scale-awareness of the cloud parameterizations. To avoid this degradation, different parameter settings for the low-resolution (10) and high-resolution (0.250) were required to achieve optimal performance in EAMv1. Xie, S, W Lin, P Rasch, P Ma, R Neale, V Larson, Y Qian, P Bogenschutz, P Caldwell, P Cameron-Smith, J Golaz, S Mahajan, B Singh, Q Tang, H Wang, J Yoon, K Zhang, and Y Zhang. 2018. "Understanding Cloud and Convective Characteristics in Version 1 of the E3SM Atmosphere Model." Journal of Advances in Modeling Earth Systems, doi:10.1029/2018ms001350.